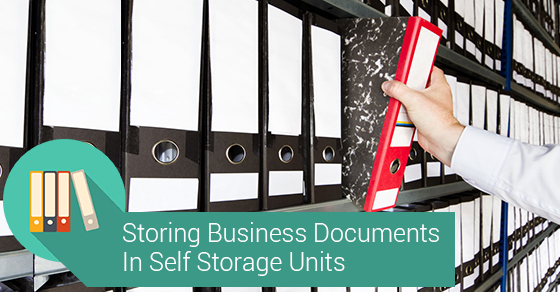 Should You Store Business Documents In A Self-Storage Unit? Storing business related documents, especially if the documents contain sensitive client details like bank accounts and tax related information, is something into which you are going to want to put careful consideration. The potential financial and even legal implications to losing or damaging records and operational information are not ones to take lightly. Here are some recommendations when you run out of office space and need a self-storage unit in which to keep business files. Make sure you choose a company with a reputation for secure storage and one which is close to your business’ location. Ease of access is very important when it comes to storing business documents. A unit with camera surveillance, keypad entry, electronic gate access and fortified locks is essential. Pay for climate controlled storage. Paper is organic matter. It is delicate and easily damaged by heat, humidity and freezing temperatures. Choose the right boxes. Different boxes are made for different storage needs. It is generally recommended that paper documents be stored in sturdy cardboard boxes with no filler. This ensures that documents do not shift position or rip and tear while being moved in and out of storage units. As with any other boxes, further securing them with packing tape and organizing them with labels will make your life easier. Label everything. When dealing with hundreds, even thousands of different files, invoices, meeting minutes, annual reports etc. it is absolutely necessary that you categorize and take stock of everything you have. In the event that you need fast access to something in storage and business is on the line, it will be a life-saver. There are some additional security considerations when storing financial and legal information, whether yours or clients. Authorization. As with anything business related, ensuring that only the authorized individuals have access to sensitive information is an important practice to maintain in and out of the office. Extra protection. In addition to the good practices already mentioned, further protecting your files and boxes with either locked cabinets or fire safes is a good idea. This not only protects your property from theft, but also offers additional precautions against weather and other potential elemental damage. As ideal as it would be to have all of your files and documents stored on your premises, a growing business often necessitates off-site storage space. Choosing a location that is easily accessible and a storage provider that is committed to safe, secure storage, with the proper security measures in place, is worth looking and paying for.